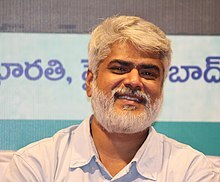 Before becoming director, he worked as an executive producer with Sekhar Kammula, and also played the lead role in Dollar Dreams, and support role in Anand. After taking a break as an actor for 12 years, he played a crucial role in 2016 film Pelli Choopulu. He also appeared in the biography film of Indian cricketer M. S. Dhoni. He was born to a Malayali family and grew up in Hyderabad and did his schooling at The Hyderabad Public School, Ramanthapur. He played the lead role in Sekhar Kammula's debut film Dollar Dreams, and supporting role in the block buster film Anand. After 12 years gap, he acted in 2016 film, Pelli Choopulu. He worked with Sekhar Kammula, Nagesh Kukunoor, and Manishankar before directing films on his own. He directed the films Avakai Biryani produced by Sekhar Kammula, and Ko Antey Koti produced by Sharwanand who was also the lead actor in that film. ^ Sunita Chowdhary, Y. "Anish Kuruvilla moves to the forefront". thehindu.com. Kasturi and Sons. Retrieved 25 October 2016. ^ "Anish Kuruvilla set to make his debut in Malayalam". 123telugu.com. Mallemala Entertainments. Retrieved 25 October 2016. ^ "Pelli Choopulu actor Anish Kuruvilla in Bollywood!". tfpc.in. Telugu Film Producers Council. Retrieved 25 October 2016. ^ a b Sekhar, Kammula. "Anish Kuruvilla Interview by Sekhar Kammula". idlebrain.com. G.V. Retrieved 25 October 2016. ^ Sangeetha Devi, Dundoo. "Over to them". thehindu.com. Kasturi and Sons. Retrieved 25 October 2016. ^ Viswanath, V. "Pelli Choopulu: Movie Review". telugucinema.com. Retrieved 25 October 2016. ^ "నన్ను నిలబెట్టే సినిమా కో అంటే కోటి". suryaa.com. Surya News. Retrieved 25 October 2016.